New report finds move may be blocked for good. 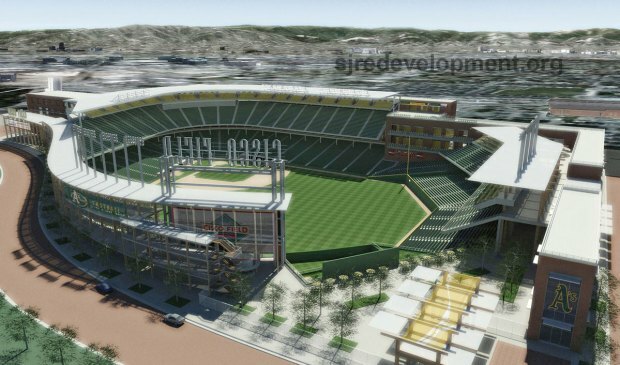 A rendering of the proposed ballpark in downtown San Jose. For weeks, the talk has been the A's deal to move south is all but done. But not so fast, according to the San Francisco Chronicle. The paper reports the Giants have no plans to relinquish their territorial rights in the South Bay. The Chronicle says multiple sources, including A's owner Lew Wolff, all say the A's proposed move to San Jose is not on the agenda for the owners meetings in Scottsdale, Ariz., next month. That goes against previous speculation, which indicated that because the A's stepped aside to allow the Giants to change management, the Giants in turn would allow the move to San Jose to go through. A blue ribbon panel formed by MLB Commissioner Bud Selig nearly three years ago to investigate the issue has yet to report on the matter.